Synthetic peptide corresponding to Human 4E-T aa 972-985 (C terminal). GenBank Accession Number – NP_062817. Our Abpromise guarantee covers the use of ab6034 in the following tested applications. WB Use a concentration of 0.25 - 0.5 µg/ml. Detects a band of approximately 140-150 kDa. The predicted molecular weight is 108 kDa according to NP_062817, however our observation agrees with that of Dostie et al, PMID: 10856257. Cytoplasm. Nucleus. Predominantly cytoplasmic. Shuttles between the nucleus and the cytoplasm in a CRM1-dependent manner. 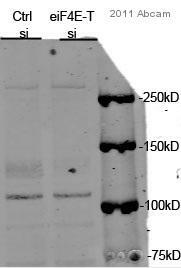 ab6034 at 0.25µg/ml staining approximately 140-150kDa band of 4E-T in HEK293 Lysate by Western blot (ECL). ab6034 at 0.25µg/ml staining approximately 140-150kDa band of EIF4ENIF1 in HEK293 Lysate by Western blot (ECL). ab6034 at 5ug/ml staining 4E-T in human pancreas tissue section by Immunohistochemistry (Formalin/PFA fixed paraffin-embedded sections). Tissue underwent antigen retrieval in steam with citrate buffer (pH 6.0). The AP-staining procedure was used for detection. Publishing research using ab6034? Please let us know so that we can cite the reference in this datasheet.